Wednesday 8th November 2006 was a black day for the town of Halstead in North East Essex. 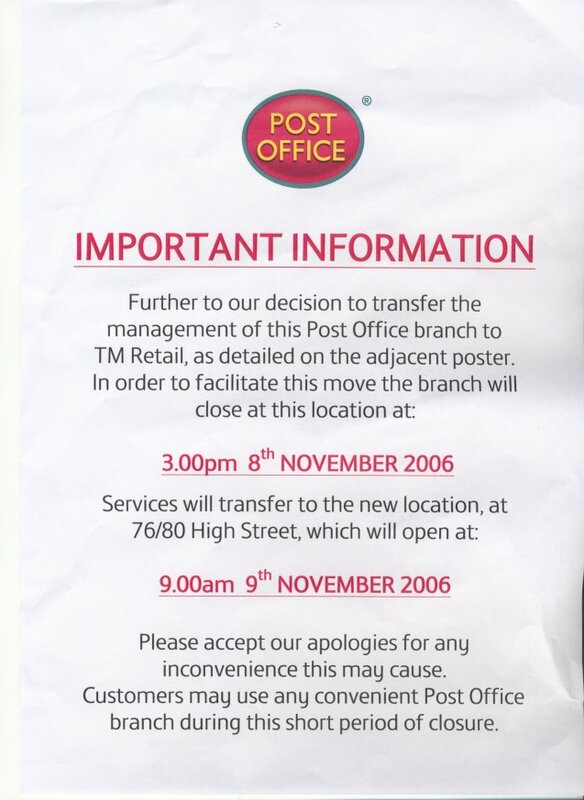 Following a farcical public consultation exercise, and alleged loss-making accounts which nobody has ever been allowed to inspect, the Crown Post Office was closed and its business transferred to a smaller, cramped and dingy Franchised Sub-Post Office in a local newsagents. On the day there was great celebration as customers and staff said their goodbyes to one another. A full Last Day Commemorative Cover service was provided by the Museum, using covers produced by CDS Covers Direct and designed by Museum Curator, Steve Knight. 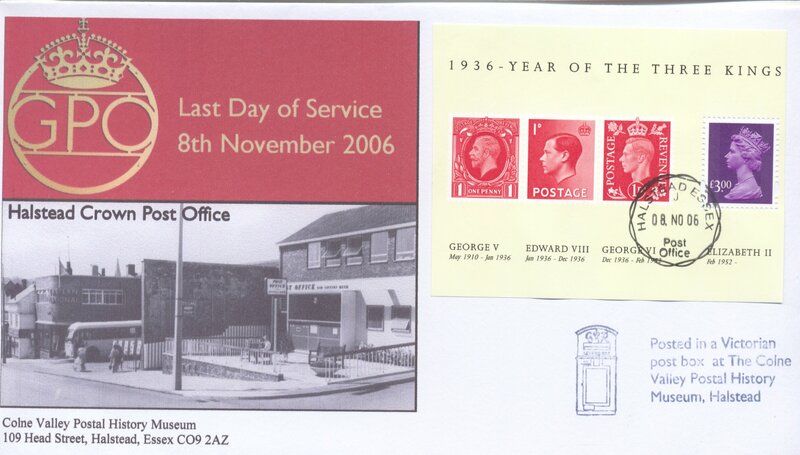 The final use of the Halstead Post Office steel counter cancel was on the last of 105 covers issued that day, at 2.55pm on 8th November. The new office will be supplied with FSPO cancels. This brought to an end of 100 years of continuous service from the Crown Office, which during that time had occupied three different buildings in the town. 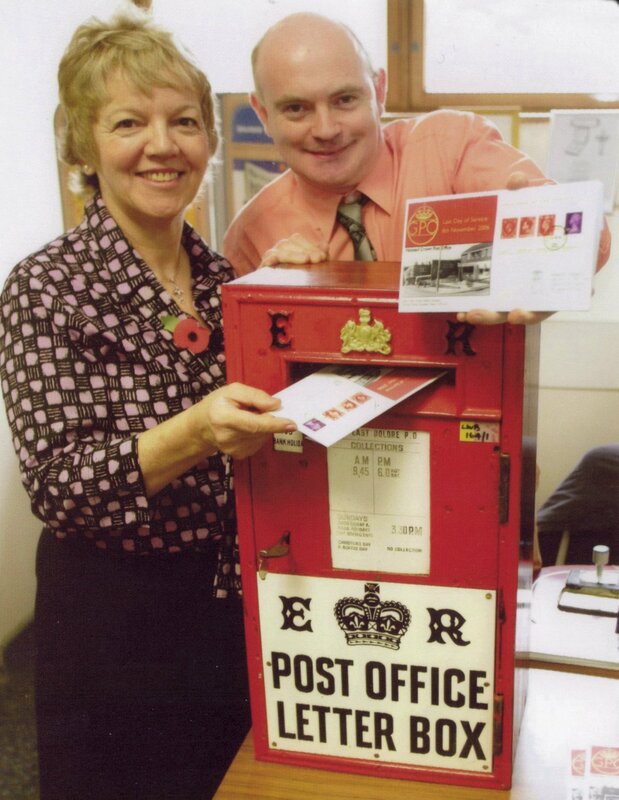 The last to close was built in 1959 and was considered the epitome of modern post office design at the time. This view of the newly opened office dates from 1962-63 and shows the original frontage. This comprised no less than four stamp vending machines and one posting aperture. In the late 1970s this was re-modelled to remove the vending machines and provide two separate posting apertures; one for Halstead local post and one for elsewhere. To the left of the picture, which is a Friths Post card, is the Eastern National bus garage with what appears to be a Bristol MW emerging from the stygian depths. This is now the site of a large supermarket. The team of 8 staff at Halstead had between them more than 120 years continuous service, led by their able Manageress, Mrs Sue Johnson. Sue has now transferred to the Crown Office at Sudbury, Suffolk, whilst her Deputy, Luke, is at Colchester. 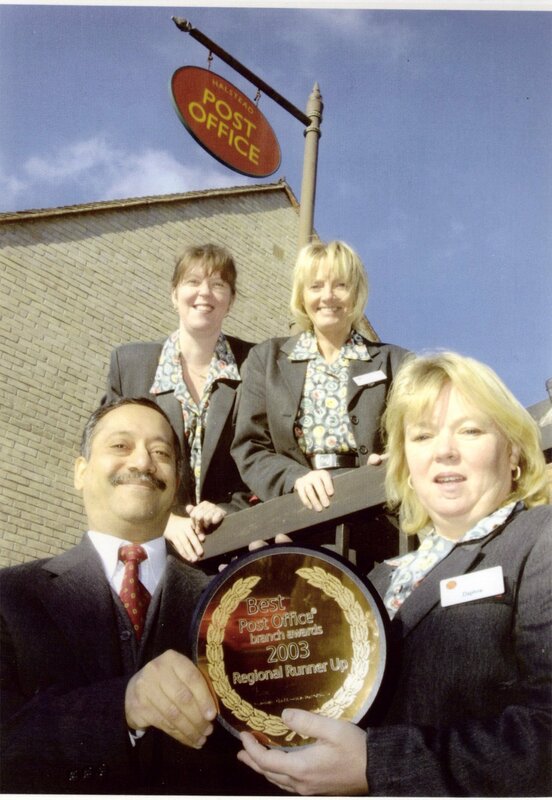 Three other staff transferred to a new SPO at Greenstead Green in Essex during January 2007. 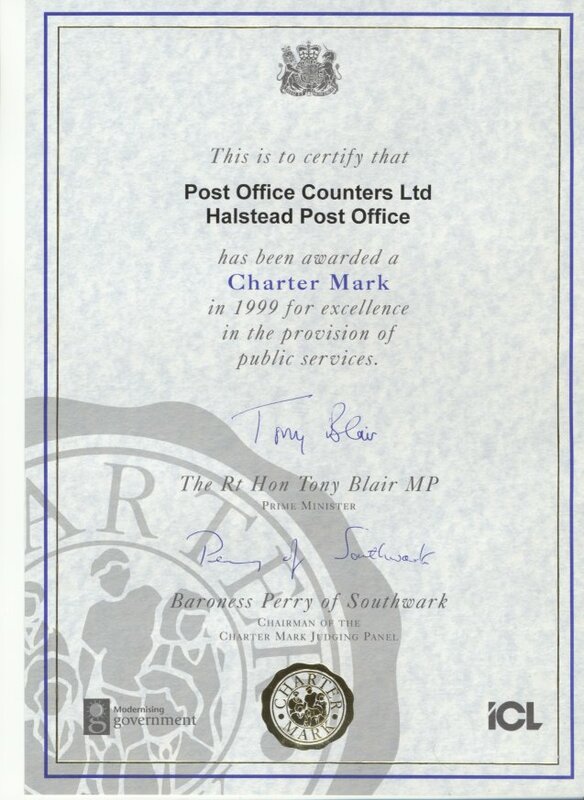 The Halstead team won many prestigious awards for their excellent work, including achieving a Chartermark for outstanding Customer Service and coming second in national competitions to find the Best Post Office. You can see some of their awards and trophies in the Museum. At 3.10pm the two Post Office lozenges were removed and recovered by a team from the Museum. One will stay in Halstead whilst the other will form part of a centrepiece postal display in Alan Mattin's collection near Colchester. Some other additional smaller items were also recovered and these are now in the Museum collection. 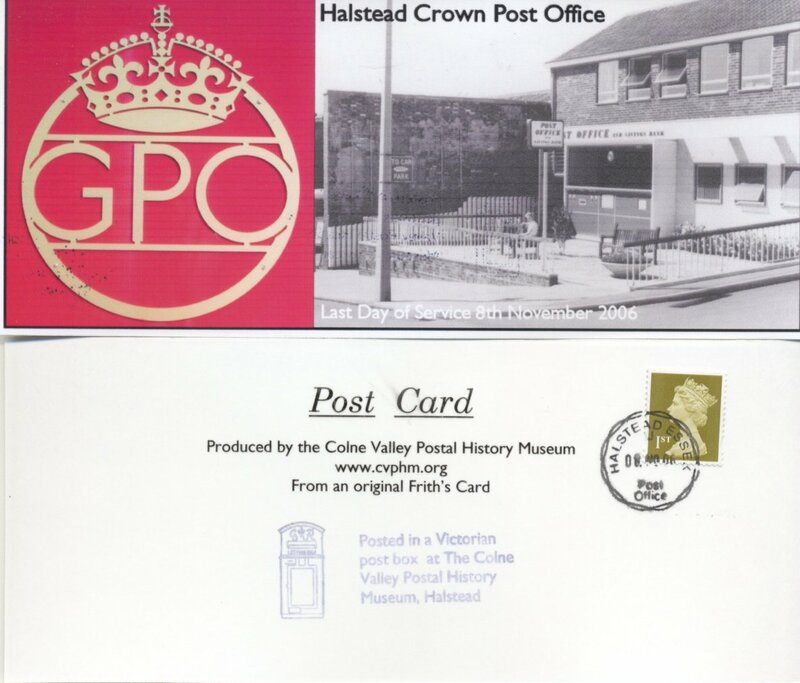 The Curator of the Colne Valley Postal History Museum would like to thank all of the staff of the Crown office for their years of cheerful and helpful service and wish them all well in their future careers. We would especially like to thank Sue Johnson for facilitating the Last Day Cover service and looking after us on the day. 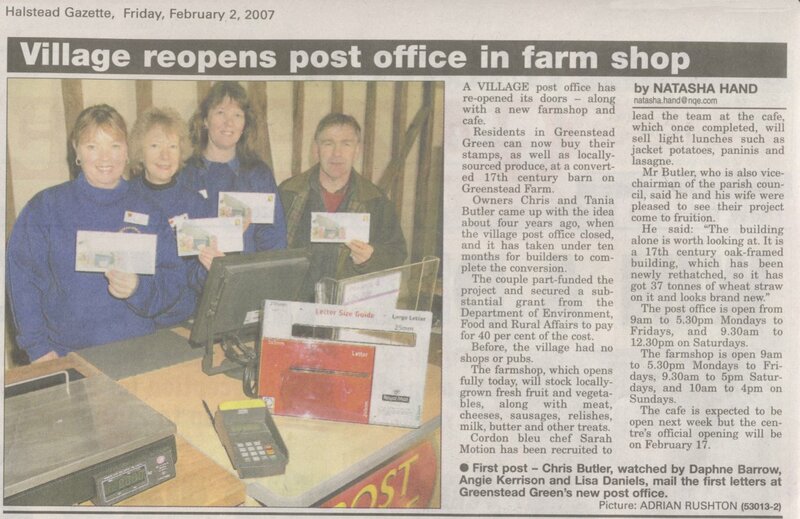 On 31st January 2007 ( a few days later than expected) a brand new Sub Post Office opened in the near-by village of Greenstead Green. Situated inside a magnificently converted 17th Century barn, the new SPO is staffed by three of the former Halstead Crown Office workers - Lisa Daniels, Angie Kerrison and Daphne Barrow. A special Opening Day cover was produced (limited to just 20) by the Museum and was duly hand cancelled with the Greenstead Green SPO CDS which has been in the care of the new Sub-Postmaster, Chris Butler (Son of the late R.A.B. "Rab" Butler MP) since the old SPO closed three years ago. The building was several weeks behind schedule due to the extraordinary amount of careful conservation work needed during the conversion and was first opened for public use on 1st February.